Transform your body, balance your mind, and connect to your soul. Start the free 4-week fitness plan that integrates Ayurveda with modern exercise and nutritional science. with modern exercise and nutritional science. You are committed to following a workout plan that will physically change your body, while raising your gratitude and love for it. You are seeking a “diet” that will change your physique, while keeping you mentally sane and feeling like your best self. You are looking to strengthen your spirituality and deepen the connection to your soul. You are interested in learning how Ayurveda and modern science can be combined for diet and exercise. You want to live a high vibe, healthy lifestyle, that balances your mind, body, and soul. Thank you for signing up! Check you inbox to get started. Pretty much every fitness plan out there promises that you will look “fit”, so long as you exercise rigorously and follow a strict diet (that may have you day dreaming about cake). It doesn’t matter how miserable you actually feel, so long as you look good. But what if I told you that it’s possible to have you best body and feel mentally your absolute best? When you take care of your mind and soul, the physical results will come naturally. The Flux Fitness Plan brings practices of spirituality, mindfulness, and meditation into your fitness routine, to create the ultimate transformation. Elements of Ayurveda are combined with modern science, allowing you to reach your fitness goal, and elevate your mental state and your soul. You will achieve physical results, whether that’s shedding some body fat or adding some muscle to your frame. And you will also feel more deeply connected to who you really are at the soul level. The food you eat fuels your muscles for a hard workout. The food you eat affects how you feel mentally and emotionally. Food nourishes your body and your mind. what you eat transforms you from the inside out. In the Flux Fitness Plan, the Ayurvedic diet is combined with modern nutritional science. You will learn about the subtle energies of foods, what to eat for your dosha, and how many calories to eat daily to achieve your physical fitness goal. You won’t even feel like you are on a diet. You will instead feel aligned with your true self: the healthiest version of you. Exercise isn’t just about moving energy through the physical body; exercise allows energy to move through the subtle body, too. When you move your body and allow energy to flow through the energy centers, or the “chakras”, you are able to reach higher levels of consciousness. 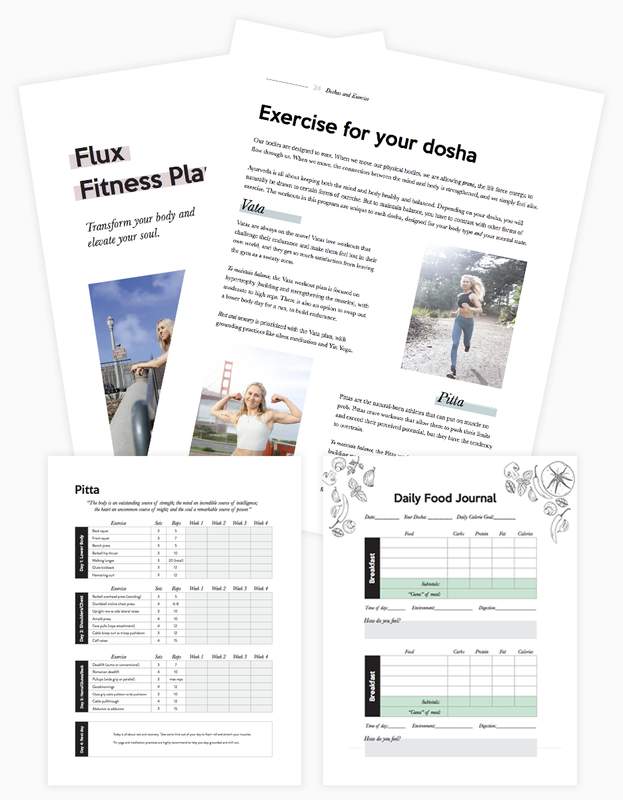 In the Flux Fitness Plan, there are three strength training programs for each Ayurvedic mind-body type (or “dosha”). Simply follow the plan specific to your dosha for 4-weeks, and track your progress overtime. Intro to Ayurveda: To set the foundation, you will learn about Ayurveda and learn about the three Doshas. Dosha Quiz: Take the quiz to find out your unique mind-body type. Ayurvedic Diet + Modern Nutritional Science: Learn how to create the perfect diet for your mind-body type. Tracking Food vs. Intuitive Eating: Determine the best way for you to diet and track your progress. Calculate Your Calories and Macros: Learn how much you should eat to reach your fitness goal. Daily Food Journal: Easily track the calories and macronutrients of your foods, and practice conscious eating. Ayurveda and Exercise: Understand the types of exercise recommended for each Dosha. Are you ready to achieve your fitness goal, while also transcending beyond the physical body? Are you ready to step into your highest self and become the healthiest version of you? Thank you for signing up! Check your inbox now to get started.